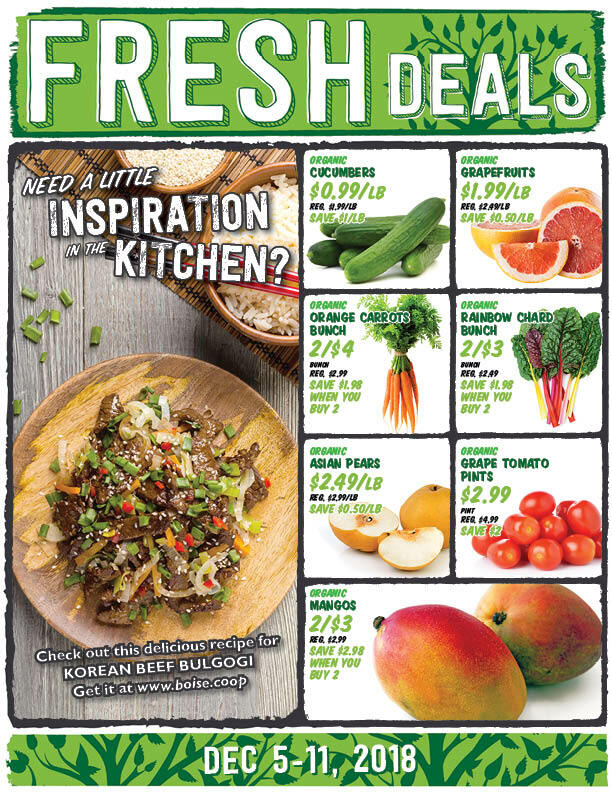 Check out this week's Fresh Deals! We've got organic D’anjou pears on sale for just $0.99/lb, and get a 2 pound bag of organic mandarins for only $4.99! 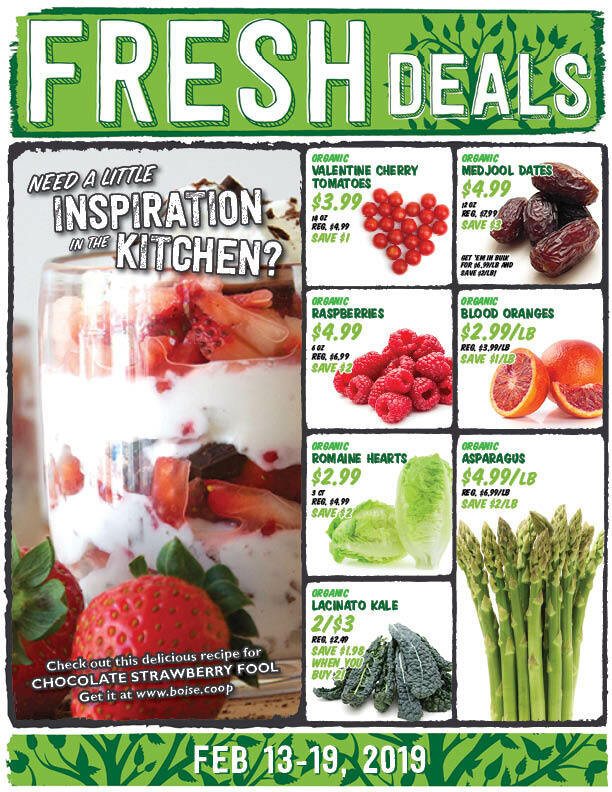 We’ve even got bulk, organic red beets on sale for just $0.99/lb, and get 2 delicious, organic avocados for $3! Drop by our Deli this week and save $2 on select Housemade 8x8 inch lasagnas, and save $2/lb on select Champignon cheeses! Come by our Meat Dept. this week, and save $2/lb on Roxy boneless, organic chicken breast, and save $5/lb on Painted Hills Bone-In Rib Roasts! Bulk up in our Bulk aisle and save $3/lb on organic Brazil nuts! You’ll also save $1.50/lb on organic, grade-A robust maple syrup! Need a little inspiration in the kitchen? Try out this tasty recipe for Garlicky Shrimp With Lemon Butter Sauce! 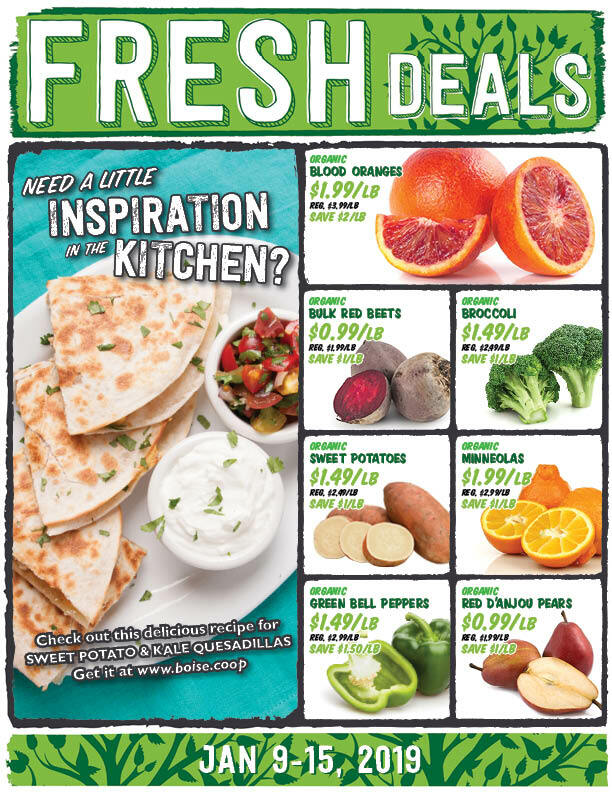 Check out this week's Fresh Deals! We've got organic cucumbers on sale for just $0.99/lb, and get a pint of organic grape tomatoes for only $2.99! We’ve even got organic grapefruits on sale, just $1.99/lb! 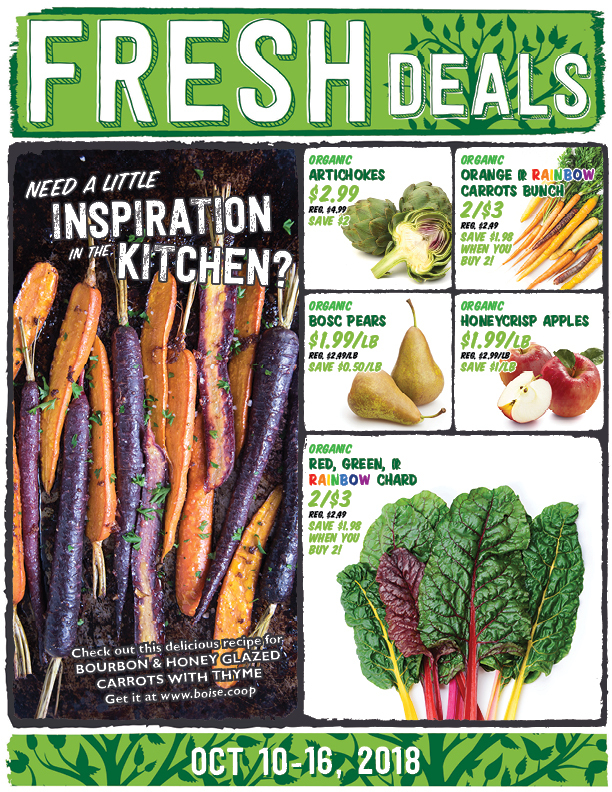 Get two bunches or organic orange carrots for $4, or get two bunches of fresh, organic, rainbow chard for $3! Drop by our Deli this week and save $2 on select Housemade take-n-bake pizzas, and save $3/lb on select Orange Windmill cheeses! Come by our Meat Dept. this week, and save $2/lb on Ranger non-GMO chicken breast! Feelin’ fishy? Save $2/lb on wild caught Pacific cod fillets! Bulk up in our Bulk aisle and save $2/lb on organic curry roasted cashews! You’ll also save $0.70/lb on organic farro berries! Need a little inspiration in the kitchen? Try out this tasty recipe for Korean Beef Bulgogi! 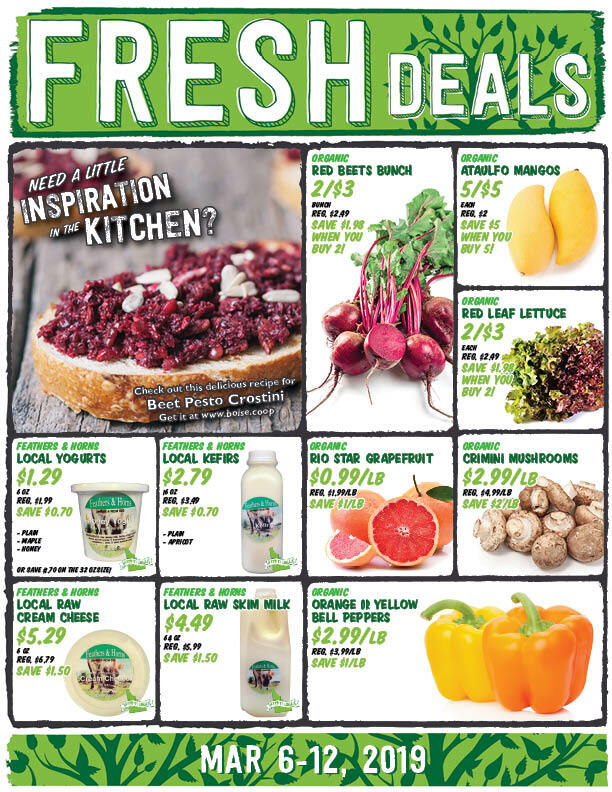 Check out this week's Fresh Deals! We've got organic Honeycrisp apples on sale for just $0.99/lb, and get 6 oz of organic blueberries, only $4.99! We’ve even got organic Satsumas on sale, just $2.99/lb! Come be our Meat Dept. this week, and save $2/lb on Ranger non-GMO chicken breast! Feelin’ fishy? Save $2/lb on wild caught Pacific cod fillets! Need a little inspiration in the kitchen? Try out this tasty recipe for a Creamy Broccoli Soup! 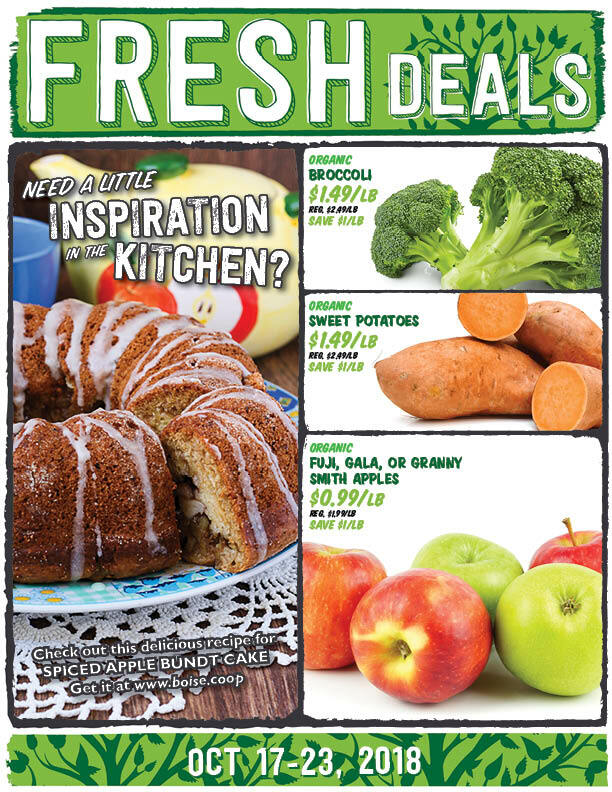 Check out this week's Fresh Deals! We've got organic Granny Smith and Fuji apples on sale for just $0.99/lb, and get a 16 oz bag of organic green beans, only $4.99! We’ve even got organic Brussels sprouts on sale, just $3.99/lb! Drop by our Deli this week and save $1/lb on select Housemade dips and spreads, and save $3/lb on select cheeses that are perfect for making fondue! Come be our Meat Dept. this week, and save $2/lb on local, grass fed rump roasts! Feelin’ fishy? Save $5/lb on wild caught Halibut fillets! Bulk up in our Bulk aisle and save $1/lb on organic red quinoa! You’ll also save $1/lb on organic Thompson seedless raisins! Need a little inspiration in the kitchen? Check out this delicious recipe for a PEAR, APPLE, & CRANBERRY TARTE TATIN! 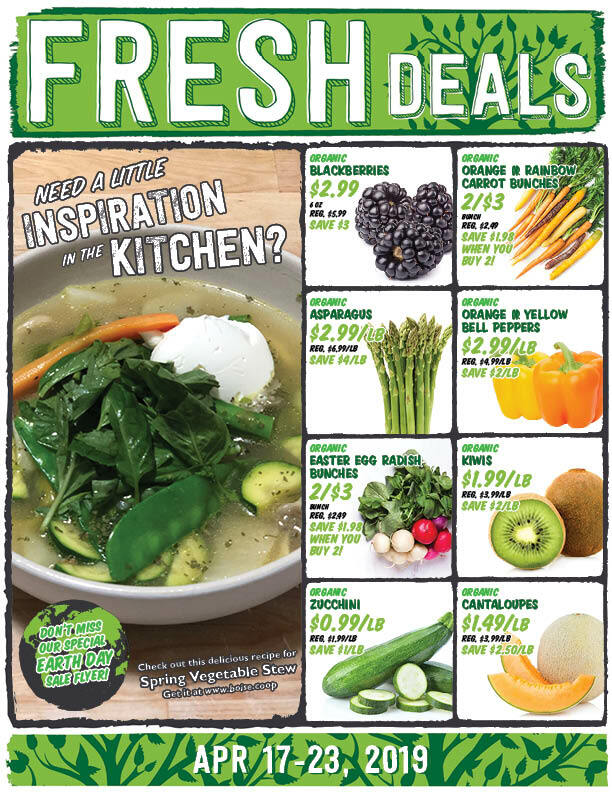 Check out this week's Fresh Deals! We've got local and organic turnips, celeriac, and black radishes on sale for just $1.99/lb! 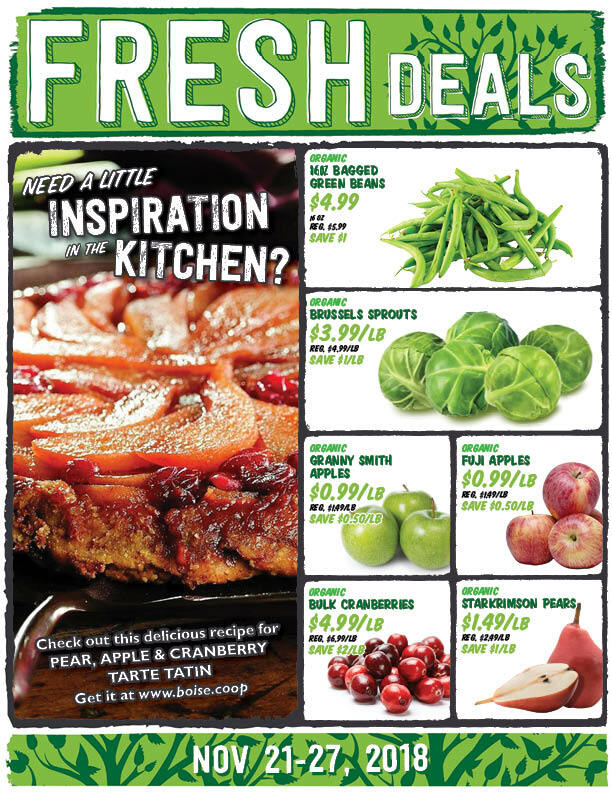 Organic Granny Smith and Fuji apples are just $0.99/lb, and get a 16 oz bag of organic green beans, only $4.99! We’ve even got organic Brussels sprouts on sale, just $3.99/lb! 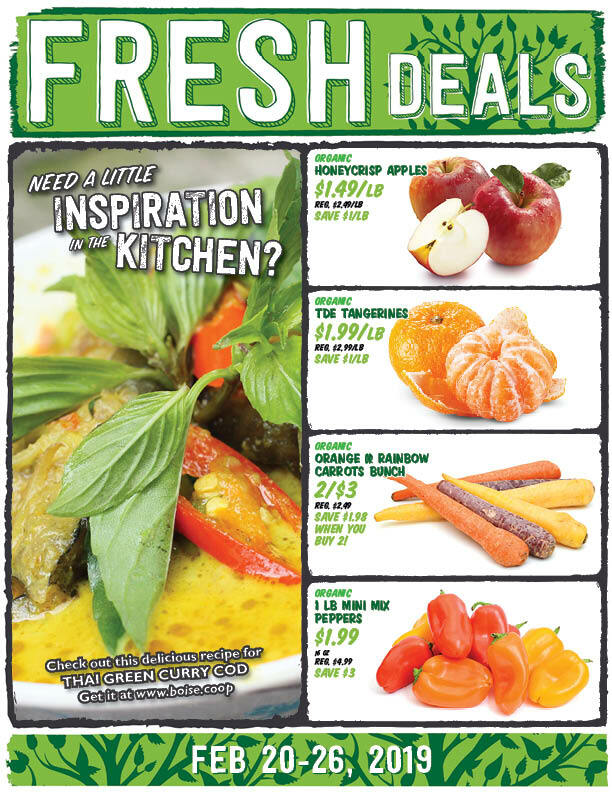 Check out this week's Fresh Deals! We've got organic pomegranates on sale, get 2 for $3! 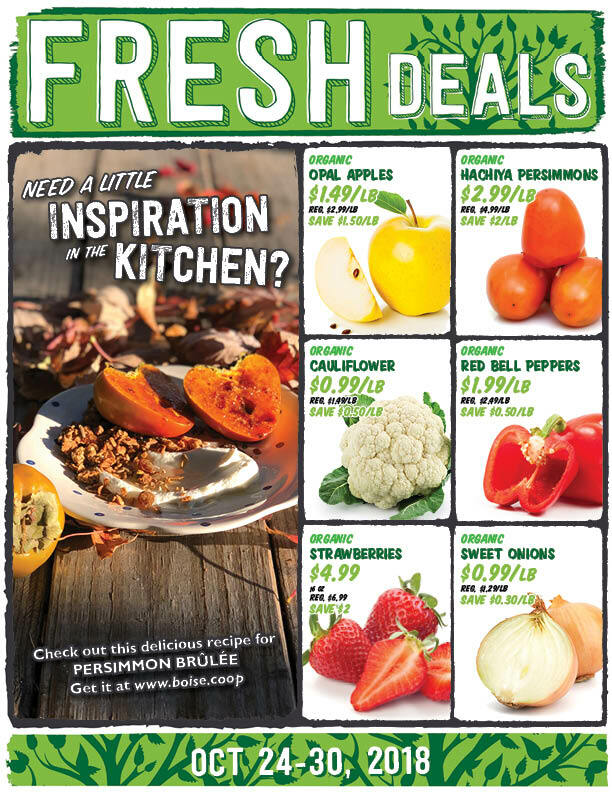 Organic green or red grapes are just $1.99/lb, and organic Bosc pears, only $1.49/lb! Drop by our Deli this week and save $2/lb on our Housemade Autumn Chicken Salad! Or save $2 on our Housemade Traditional or Bolognese Lasagnas! And save $2 our super delicious Housemade 4” Pumpkin Swirl Cheesecake. We’ll meet you in our Meat Dept. this week, where you’ll save $2/lb on juicy Painted Hills grass fed ribeye steaks! Feelin’ fishy? 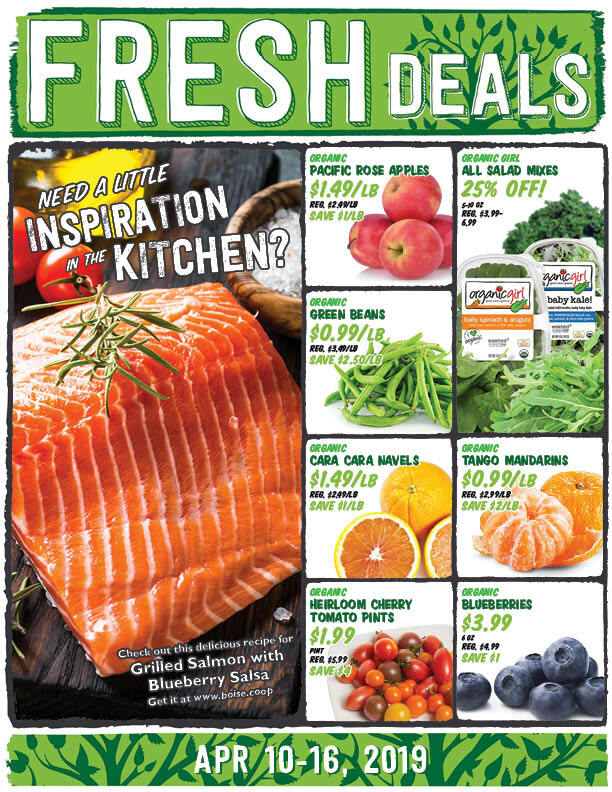 Save $2/lb on C&G’s Wild Alaskan Coho salmon! Bulk up in our Bulk aisle and save $2/lb on organic walnut halves & pieces! You’ll also save $2/lb on organic, juice-sweetened dried cranberries! 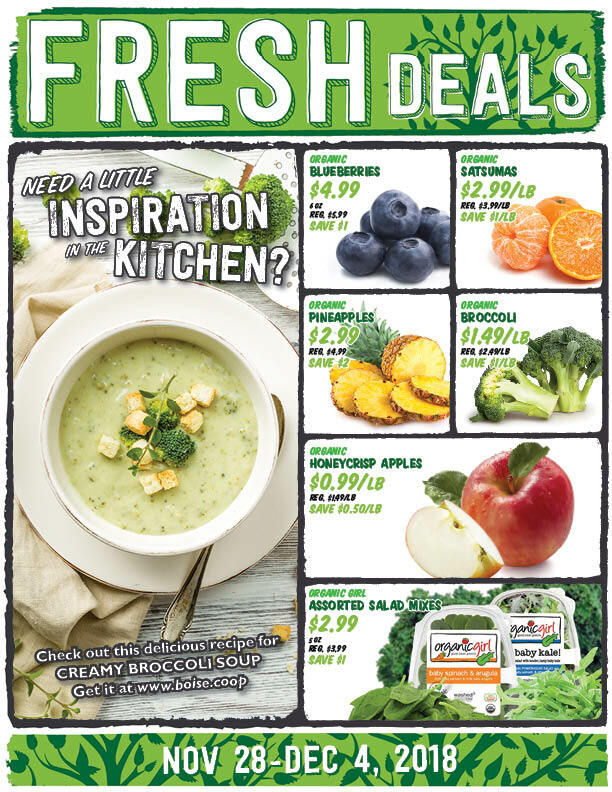 Check out this week's Fresh Deals! 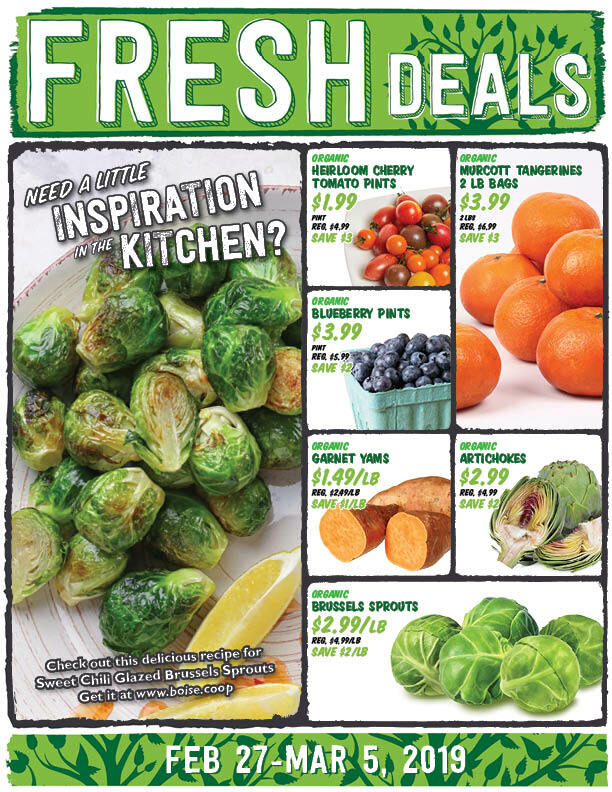 We've got organic Brussels sprouts on sale for $3.99/lb, organic green or red D’anjou pears just $1.49/lb, and organic broccolini bunches, only 2 for $3! 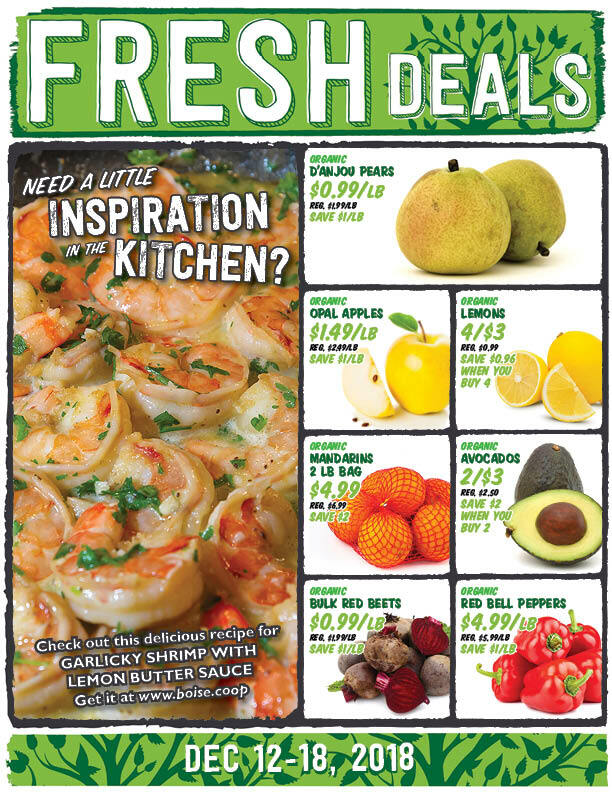 Check out this week's Fresh Deals! We've got organic broccoli on sale for $1.49/lb, organic sweet potatoes just $1.49/lb, and organic Fuji, Gala, or Granny Smith apples, only $0.99/lb! Need a little inspiration in the kitchen? Check out this delicious recipe for a Spiced Apple Bundt Cake! 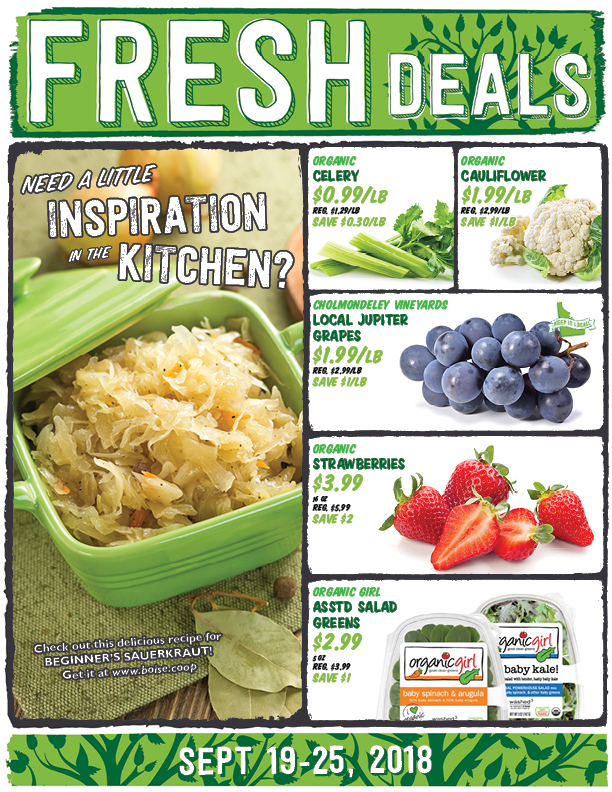 Check out this week's Fresh Deals! We've got organic Bosc pears on sale for $1.99/lb, organic Honeycrisp apples just $1.99/lb, organic artichokes for $2.99, and bunches of organic red, green, or rainbow chard or orange or rainbow carrots, 2/$3! Drop by our Deli this week and save $1 on a pint of our Housemade Yam & Sage Soup! Save $1 our amazing Housemade Verde Chicken or Chicken Alfredo Lunchboxes! Need something a little sweet? Our Housemade Pumpkin Bread slices are 2/$3 this week! Save $1 on a 4 oz Montchevre Coeur de Chevre, or save $0.80 on assorted Montchevre Crottins! Swing by our Meat Dept. and pick up some of our Housemade Hamburger Patties- they’re two for $5. Save $2/lb on Ranger non-GMO chicken breast, Desert Mountain local grass fed cross rib roast or steak, stew meat, or ground beef! And while you're here, don't forget to stroll down our bulk aisle; this week you'll save 30% on organic pumpkin pie spice, save $2/lb on fair trade Doma coffee, save $1.60/lb on organic bittersweet chocolate chips, and save $3.90/lb on organic Dutch cocoa powder! Need a little inspiration in the kitchen? Check out this delicious recipe for BOURBON & HONEY GLAZED CARROTS WITH THYME! 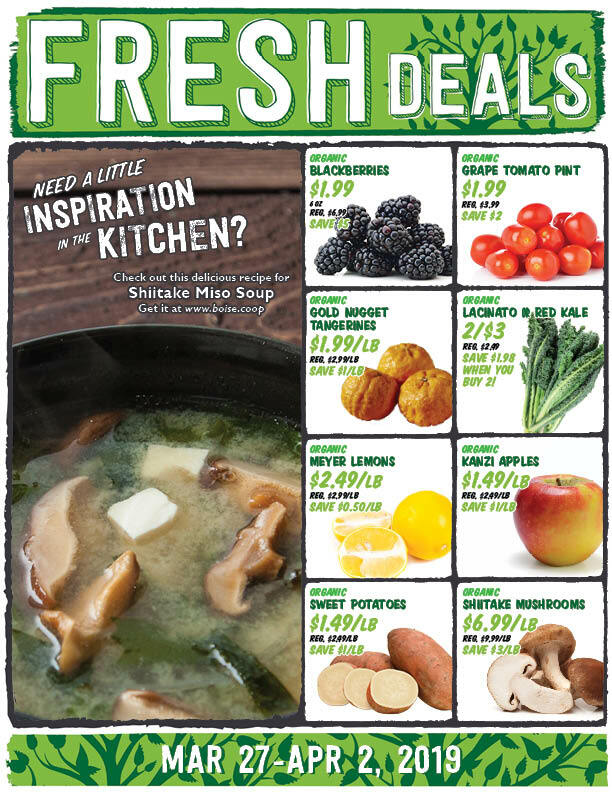 Check out this week's Fresh Deals! 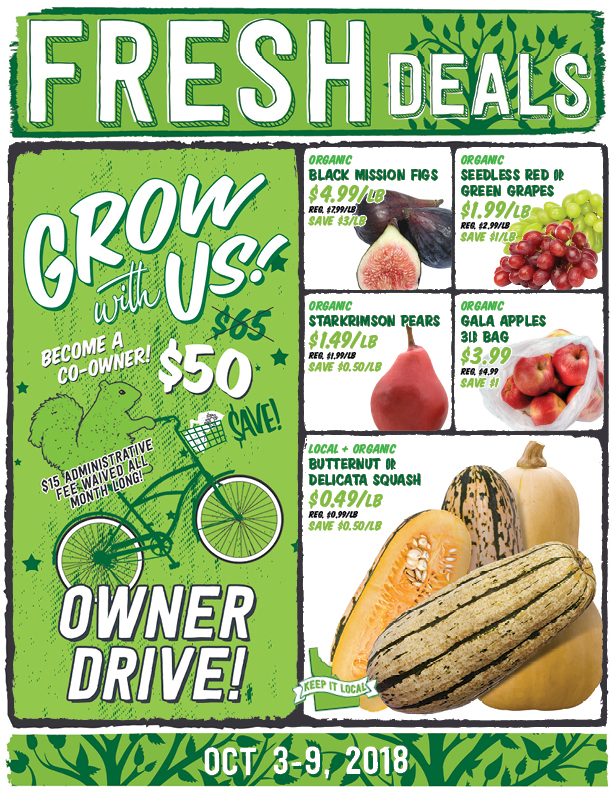 We've got organic black mission figs on sale for $4.99/lb, organic red or green seedless grapes just $1.99/lb, organic Starkrimson pears for $1.49/lb, and 3 lb bags of organic gala apples for $3.99! 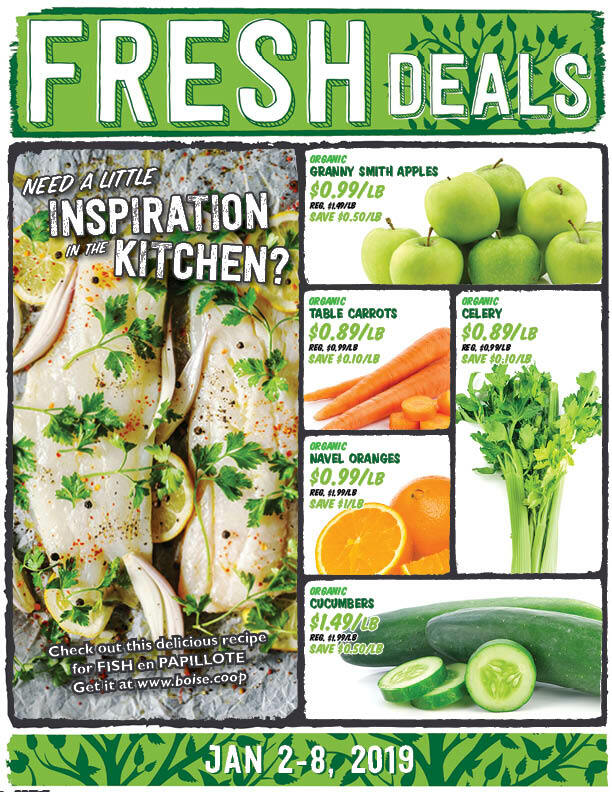 Check out this week's Fresh Deals! We've got some really great produce deals going on with our Local Flavors Sale this week, like ALL local tomatoes 20% OFF! ALL local potatoes 20% OFF! ALL local peppers 20% OFF, and tons more! 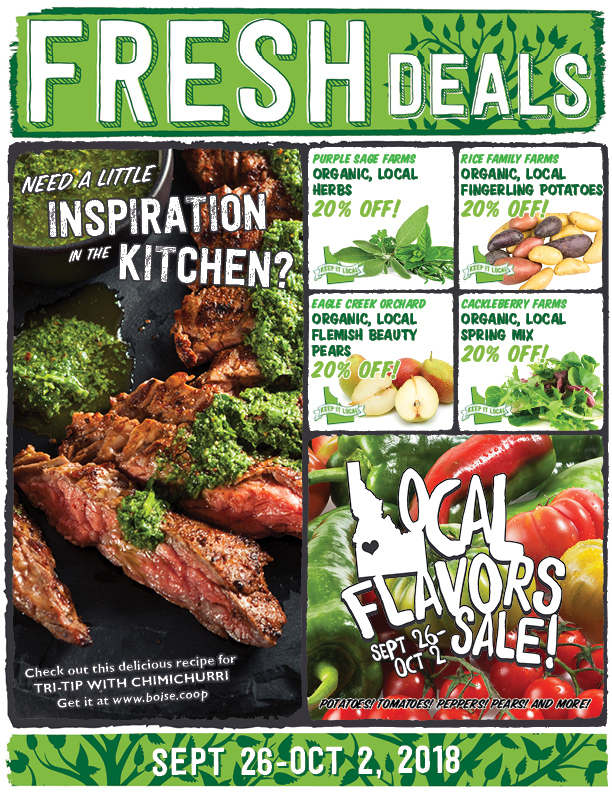 Enjoy huge savings this week on LOCAL products throughout the store! Drop by our Deli this week and save $1 on our Housemade 16 oz Chicken Noodle Soup! And save $2 our amazing Housemade 8x8” Chicken Pot Pies! Need something sweet? Save $1 on a slice of our Housemade Blackout Cake this week! And you've got to try Kimberly's Best local Muffaleta Goat’s Milk Cheddar- it’s $1 off. Swing by our Meat Dept. and SAVE $2/lb on fresh, local, Desert Mountain grass fed sirloin tip roast or steak! Or save $6/lb on wild caught, fresh Halibut fillets! And while you're here, don't forget to stroll down our bulk aisle; this week you'll save $2/lb on organic dried chili lime mango, save $3/lb on organic ground cinnamon, and save $3/lb on organic roasted and salted cashews! 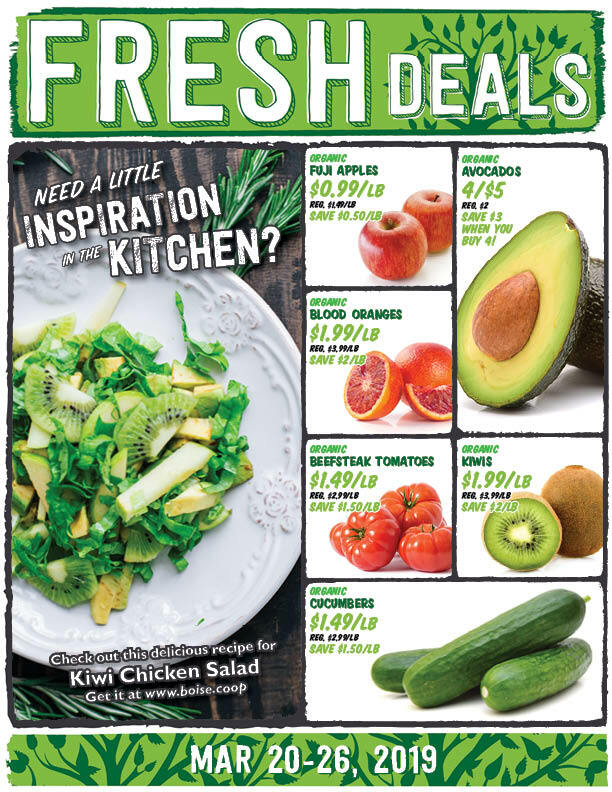 Check out this week's Fresh Deals! 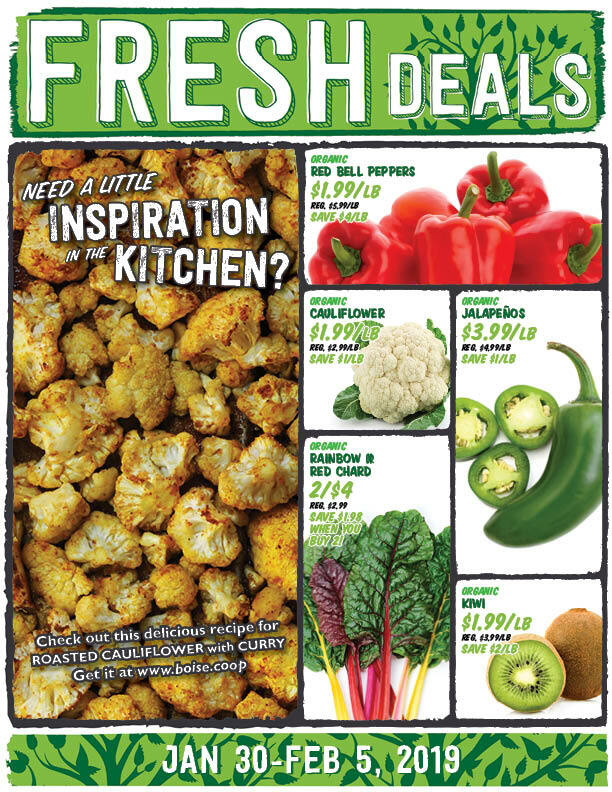 We've got organic cauliflower on sale, just $1.99/lb! Or get some organic celery, only $0.99/lb. We’ve also got some really beautiful, juicy and delicious, local Jupiter grapes for $1.99/lb! 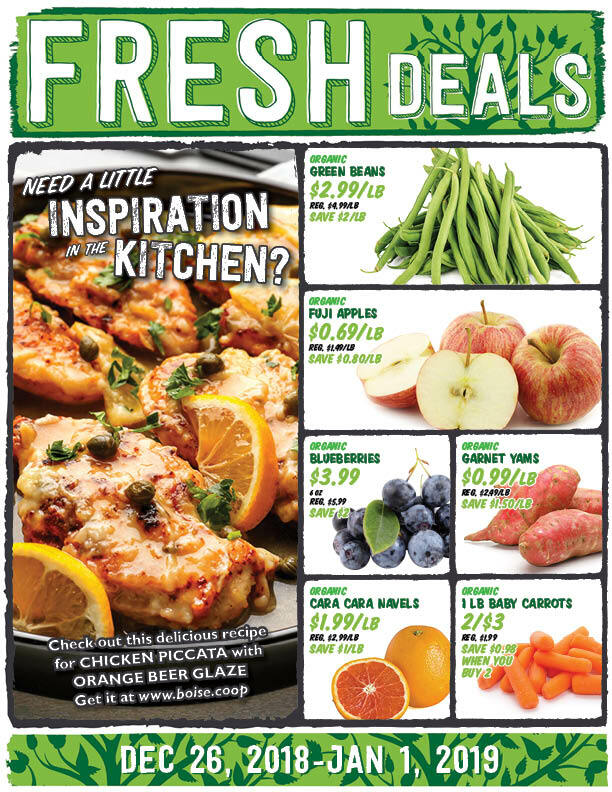 Check out this week's Fresh Deals! We've got organic bi-color corn on sale, 4/$3! Or get some organic romaine lettuce, 2/$3. And we’ve got some really beautiful organic Pink Pearl apples going for just $1.99/lb! Drop by our Deli this week and save $3/lb on our Housemade Roasted Red Beet Tabouleh, Balsamic Beets, or our Beet, Apple, and Blue Cheese Salad! Need something sweet? Save $1 on a slice of our Housemade Ghirardelli Cake this week! And you've got to try Kimberly's Best local chevre or feta- they're $1 off. Swing by our Meat Dept. and SAVE $7/lb on fresh, wild caught King salmon fillets! Or save $3/lb on Painted Hills NY strip steaks! And while you're here, don't forget to stroll down our bulk aisle; this week you'll save $8.20/lb on organic goji berries, save $3/lb on organic roasted and salted pumpkin seeds, and save $7.50/lb on whole, organic hazelnuts!